the beat drops. my eyes open. my alarm’s gone off (yes, it’s prince). i reach for the phone and slide right. 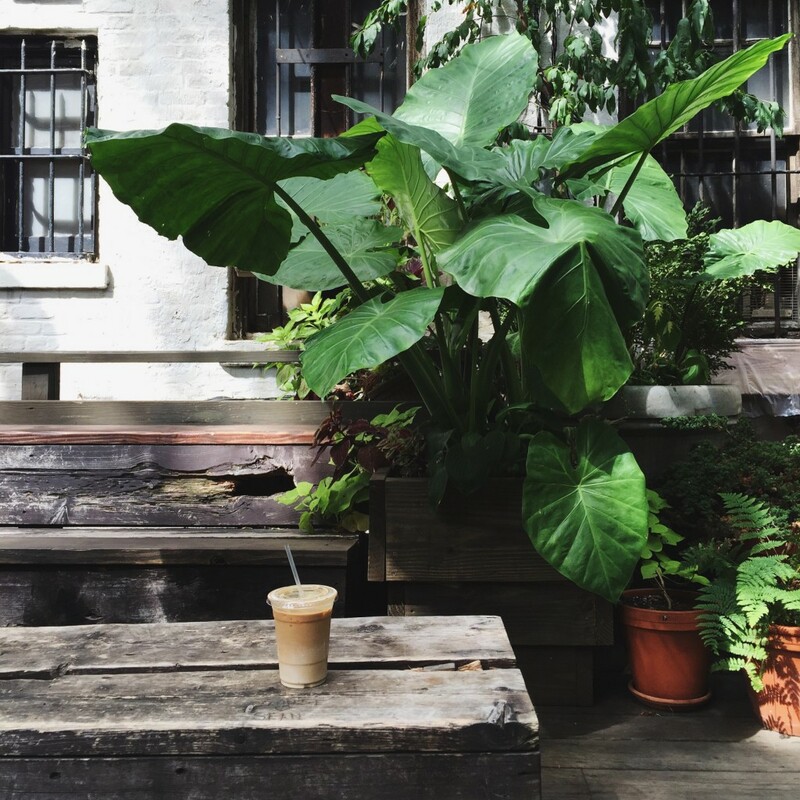 it’s a saturday in july, and for a lot of new yorkers that’s become synonymous with workout, iced latte & backyard coffee shop chill time. my ideal situation would be workout, iced latte & pool, but i live in nyc now and those pools are way too hard to come by. so, i’ve adapted to a new, and slightly more productive, summer living routine. 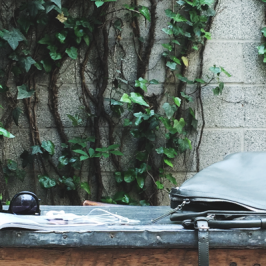 now back to that coffee shop backyard life. in nyc, on our lucky non-thunderstorm/hazy days, the sun’s warm rays, light outdoor breeze, and hustle and bustle of a coffee shop compound into a form of cosmic seasonal magic. it’s the type of energy that puts you in the zone, and you become inspired, present, productive and entranced at exactly the same time. whether you’re on a solo mission, or you march in with your squad, it’s hard to leave an outdoor coffee sesh without feeling as if something special transpired. it’s a chance to change up your scenery, recharge and just be. 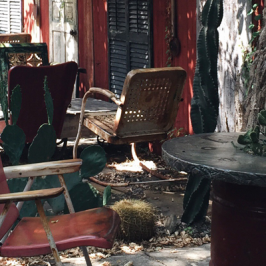 it’s summertime and the living is easy, so here are my 7 favorite backyard spots – manhattan style. 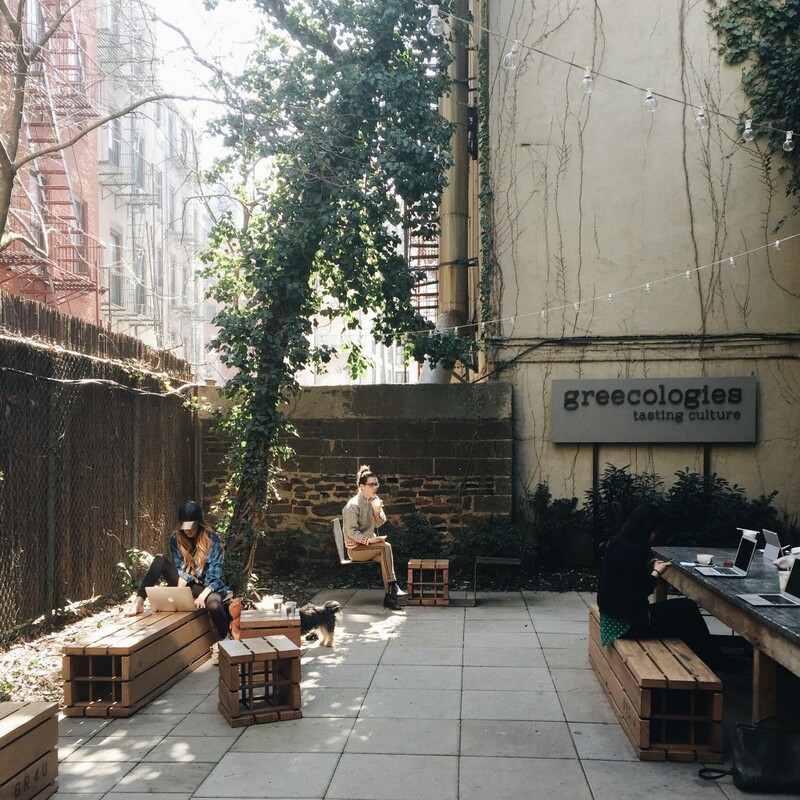 greecologies is the spacious oasis you could spend hours on end in. this beautes industrial-esque seating, set against the lush green ivy covered walls, is quite enchanting. 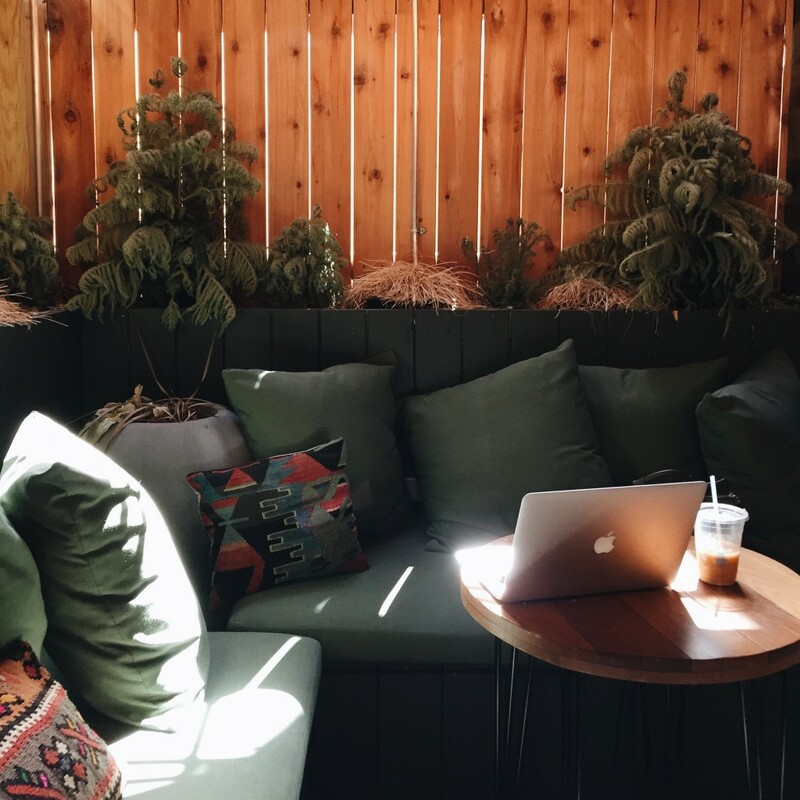 while an iced beverage is a must, their made-in-house greek yogurt options complement the space’s earthy scenery perfectly. lounge in the back and listen closely. you’ll notice that beyond the chatter of friends, the location of this backyard is able to somehow block out the city’s noise. this space is magic. so much so that there’s a whole post dedicated to its magic. 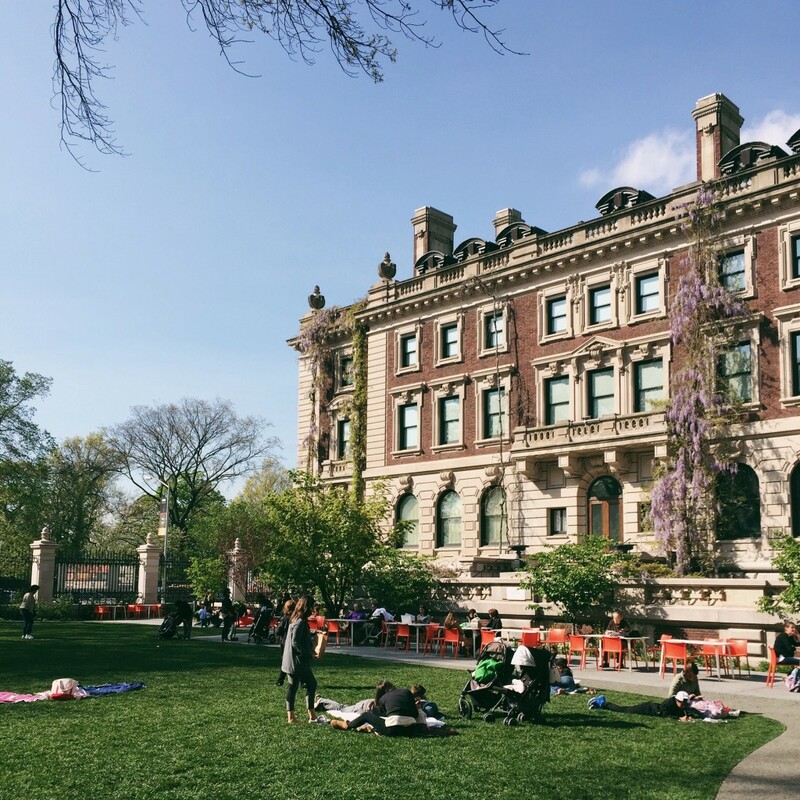 living on the upper east side, the arthur ross terrace and garden at the cooper hewitt has become a go-to destination. 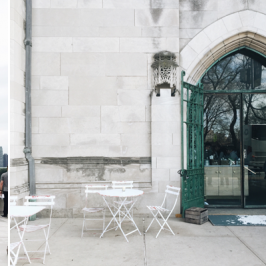 its prime location on museum mile, right on fifth and across from the reservoir, makes it the perfect place to simultaneously people watch and let your daydreams run wild. unlike other backyards, this garden isn’t surrounded by tall skyscrapers, and at times you’ll forget you’re in the middle of the concrete jungle. with a cafe inside the museum, and free entrance to the grounds, you’re always welcome to spend hours and hours here. if you prefer feeling like you’re on a sun-drenched tropical island, then may i suggest you visit saturdays in soho. the coffee is always incredibly rich, tasty, and served with a smile. 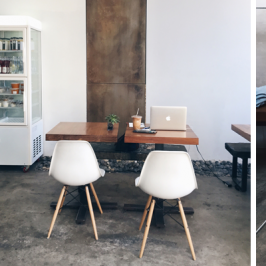 this uber chic surf/coffee shop is definitely where you’ll find the beautiful people. amidst the clamor of conversations, coffee, and lush greenery, you’ll definitely style stalk and leave creatively inspired. intelligentisia. oh how i wish you had more locations in manhattan. the intelligentsia in venice is the coffee shop that pretty much birthed escapeyourdesk, so whenever i am yearning for that og feeling i head to the highline hotel. the outpost within the historical highline hotel will leave you feeling as if you’ve traveled back in time. once a theological seminary, and the birth place of ‘twas the night before christmas,” the space’s rich history is something you’ll feel as you make your way through the hotel’s lobby. grab your cup at the indoor coffee bar, and make your way to the front or back patio. take a seat, and a moment, to just gaze at the hotel’s exquisite original brick exterior. rapha cycle clubs have been created to serve as an inspiring meeting place for road riders. in addition to riders, i think this space is also inspiring to anyone who appreciates a space designed with effortless intention. 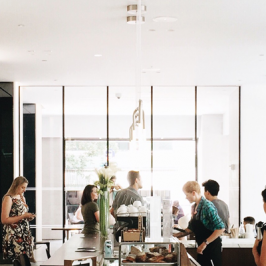 this curated shop and cafe come together to serve as the perfect creative meeting space. the steady influx of riders hanging up their bikes, chatting & picking up some coffee makes for the right amount of bustle you’d hope to find in a cafe. what’s key about this location is its backyard. lots of seating, and with its location in soho, it’s a welcome reprieve from the high volume of foot traffic that line prince street on a busy weekend. and if you’re a rider, rapha holds regular rides, events and viewing parties of the season’s biggest races. tom’s is a brand that knows how to carry its experience beyond just the wares that it sells. 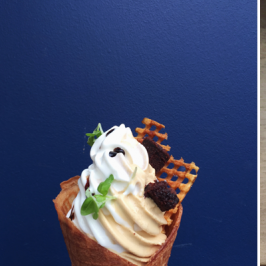 they’re experience builders, and their expertise is showcased in the nolita space. 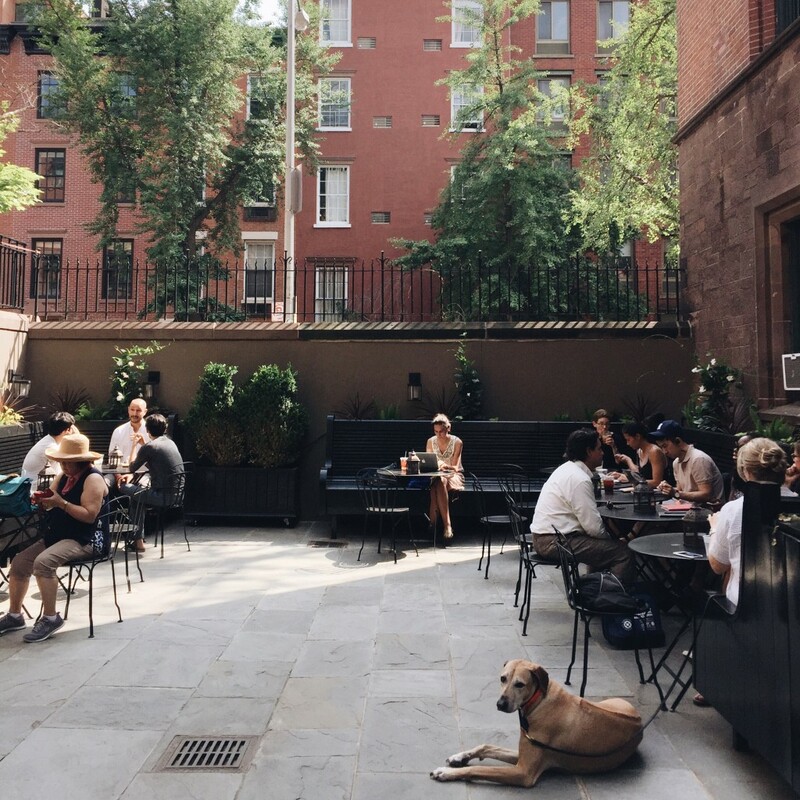 much like its counterparts in venice and chicago, the nolita location is home to a tom’s roasting company and an eclectic outdoor gathering space. designed to a t, this space feels as if you’ve stepped right into a tom’s ad. rich colors, textures and patterns are impeccably on brand, and when the sunlight hits this place just right its warm tones give it an ethereal glow. i love that the back yard never gets too busy and you can spend a few hours here working, or chatting away, completely undisturbed. 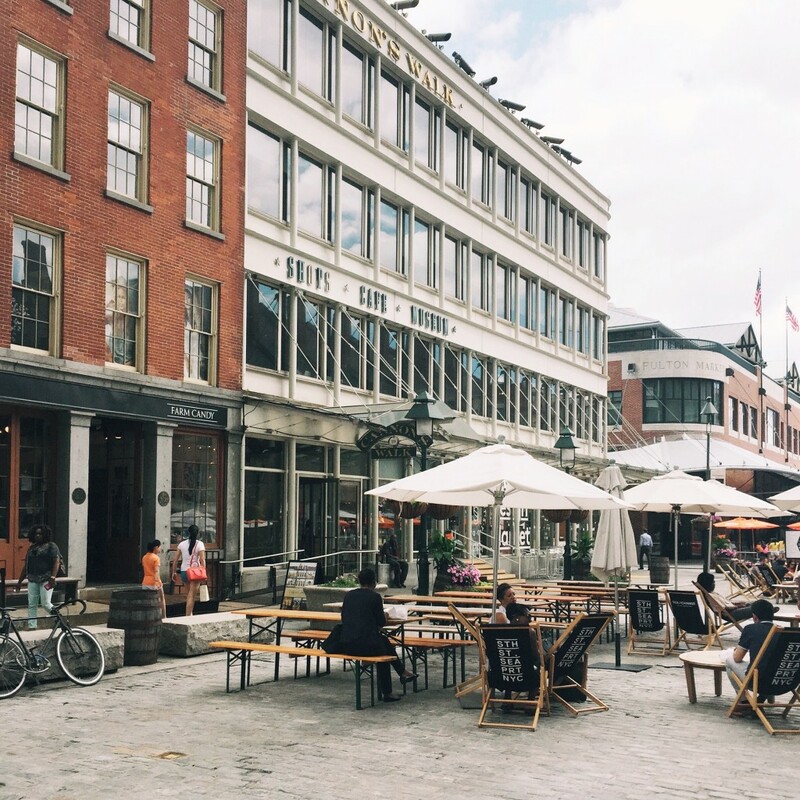 the seaport district is for anyone who has ever wished they could go back to the early 19th century. back to the days when ships sailed into the ports of manhattan, and horses worked for the mta. lined with cobblestone streets, and some of the oldest architecture in manhattan, this neighborhood is bursting with historic charm. coined as a modern-day entertainment district, it’s become home to a diverse mix of up-and-coming designers, shops and food destinations (aka smorgasburg). grab a cup of coffee from the design market’s coffee portal window and recline in one of the many hammock like seats. 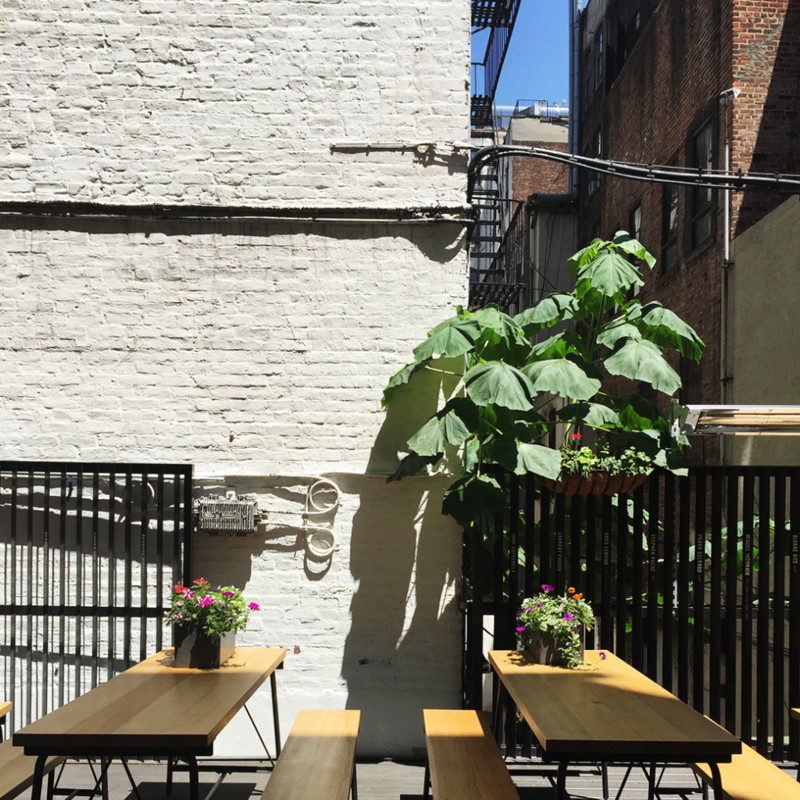 Caffe Bene on Broadway and 12th has an adorable back patio open year round! The cafe itself is a chain (one of my favorites) but this is the only one with a backyard!